Everyone knows staying on a diet is hard and boring. I know I want some chocolate cake at the end of the day. Dieting is hard because you have to eliminate or reduce calories/certain foods. Since I have been dieting for almost 4+ years NOW (a long time to diet) it became a [lifestyle] "HABIT." I no longer consider my lifestyle eating-habits a diet when I'm trying to cut off weight, I'm always dieting to be smart about the foods I consume and my health. 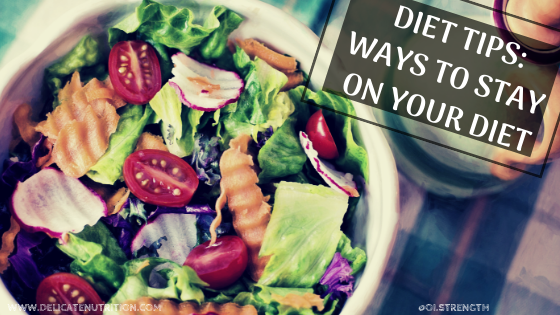 Through the times of dieting, I have found some ways to help to "stay on track" on your diet. What Do You Consider A Diet Anyways? A diet is when you are either: In the process of losing fat/weight or wanting to have better foods within your lifestyle [your eating habits]. Many people consider diets not a lifestyle choice but rather a chore/tool for weight/fat-loss. Dieting is when you are on a strict program - That is reducing/eliminating calories, foods, and/or only eating certain foods. People will end up going on this "Diet" for X amount of weeks/months JUST to lose the weight/fat. BUT that is a problem for most - most people end up getting the weight back on due to not being strict on themselves (once you have stopped the dieting process). I believe in a lifestyle choice rather than a "chore." If your goal is to become shredded/look leaner, you should adopt the lifestyle that will make your body look good [and you will feel a WHOLE lot better!]. So, You should be focusing on clean, healthy, beneficial foods throughout the day, every day, every week to maintain a good healthy body. Since I have adopted this "healthy lifestyle habit" (Dieting), my theory of foods has changed - I believe foods we should consume be beneficial and nourishing, and use food as an energy source, not just to indulge in food for fun. If you make this a lifestyle habit, I guarantee you that your "dieting" will become much easier to endure and to go about - You will be more satisfied than ever before due to you benefiting yourself - your body. In my opinion, staying on a diet for x amount of days, weeks or months is not the right way to go about it. People should be aware of nutrition and what they are doing to themselves - so, a healthy lifestyle should be thought of. No wonder why the USA has an obesity problem! I'd follow these tips if you're wanting to live a healthy lifestyle. A. Avoid sugary beverages. They can add up in calories quickly without knowing and it's just bad overall. I prefer water, or juices. B. Drink water before every meal. This is beneficial because it will get you full before even eating. Drink water upon awakening and before bedtime. D. Avoid fast food places, meal prep is the way to go. The Benefits of Adopting the Dieting Lifestyle "Healthy-Lifestyle"
If you are one of those people who wants to look SHREDDED year-round, consider dieting all-year-round. I know it's hard but indulging in junk/bad food every day IS NOT GOOD. Plus, you feel groggy eating junk. But there are ways to help with this and that is called having a Cheat Day or having a cheat-meal. Read more here. Coffee, Fat burners, Appetite suppressants are all ideal to help suppress your hunger. Using fat burners to help curb your appetite can be good. Sometimes it works for people and sometimes it does not. People end up getting immune to the fat burners and getting plateau'd. 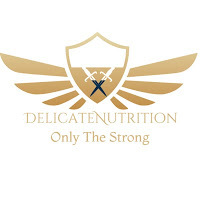 - There's a lot of supplements on the market that will help with your hunger. DMHA for an example, etc. An increase of cravings (sweets / Junk). Staying Hydrated will keep YOU FULL - So, try staying hydrated throughout the day, every day. Reduce the intake of soda, juices, etc and implement more beneficial beverages. Portion control is very important. There's a problem called "portion distortion," so, that means that you are putting too much food on your plate without even knowing it. This can be because: The food is calorie-dense or you do not know anything about portions and how to separate calories. For example; Having a big breakfast, then a big lunch, snacks, big dinner, then dessert - count of those calories and see what the results are; By controlling your portion, you can divide up the calories so you do not go overboard and to stay within your diet. - Calorie dense foods are tricky to spot - I HIGHLY recommend doing some type of research before eating - To know what you are putting in your body. Fiber, vegetables, carbs are good ways to keep yourself full. If You Cook your own meals, it will be more beneficial because You know what You are putting in your food/how you are making it. Fast food is a problem for most because it's unhealthy and has no beneficial nutrients (although some meals may be nourishing). More beneficial nutrients - I find that eating out to fast food places, we, or I think, people do not get enough vital nutrients such as vegetables and fruits, they end up eating fries, a burger, soda, and other junk foods. That is HOW people end up getting overweight, not caring about nutrition! Supplementing something for your diet is ideal; this will help a lot if you are deficient or lacking [nutrients]. 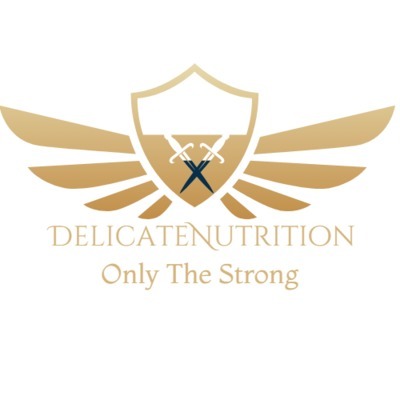 If you are dieting/living the healthy-lifestyle, having the beneficial nutrients is critical - therefore, supplementation would ideal in this case. -> Always try to get all of your nutrients from whole foods (real foods: veggies, fruits, meats, nuts, etc). -Fat burners would be considered a supplement. To get more of an understanding of macros/calories, Download the App called, "MyfitnessPAL"
You have to understand what is a diet for you personally. You have to be committed to this lifestyle. It is not easy, nothing comes easy. If it was easy, no one would be overweight/underweight and would not be asking how to diet (to lose weight/fat essentially). So Do not do these to DIET! Do not Stick with a Diet that is making you miserable. I know I've experienced this, super low carbs (low carb diet/keto diet), it's very tedious to endure. I was miserable [kinda] on the keto diet, so I stopped. Once I stopped and served my body the right way, I became happier, less irritable, more enjoyable with myself & others. Fat burners? I would say yes...and no..it can help, but people eventually get used to the effects of the fat burners and that leads to a plateau. A plateau is no joke so...I would diet naturally or switch/cycle off the fat burners. Find what works with you and for your body. Certain food selection(diets) such as vegan diet or keto diet may not work because your body may not tolerate it, so, you have to find another way. That's why people say this diet doesn't work, it's a fad, just hype or whatever - but really it comes down to knowing your body and how you can control & manipulate it. These are the ways/methods that I go by to stay on my [Diet Lifestyle]. There's no Pills, or secret formula to stay on a diet or to lose weight/fat - It's all a mental challenge. So, challenge yourself! If there's anything else you would like to know, comment below! If you're looking to improve your physique and receive more knowledge, click on the links below to start reading! Extra: Like & Comment on VID! 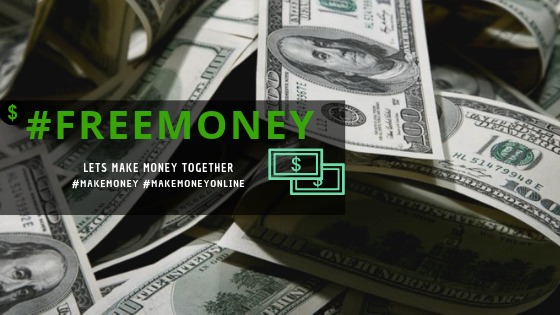 Wanting to make some Free MONEY With me? Click the Picture, Read about it, Join with me!